The 2017-18 Williams Center for the Arts Performance Series will include debut appearances by NEA Jazz Master Charles Lloyd; renowned tenor Mark Padmore and pianist Paul Lewis performing Schubert’s Winterreise; choreographers Pascal Rioult, Alonzo King, and Pam Tanowitz; New York’s Bedlam theater company; Iranian singer Azam Ali; and Venezuela’s Betsayda Machado, among many others. Return engagements include jazz virtuosos Cécile McLorin Salvant and Fred Hersch, the Brentano String Quartet, Ping Chong + Company, and Orpheus Chamber Orchestra. The Williams Center will also introduce the National Theatre Live broadcast series and Tapestries: Voices Within Contemporary Muslim Cultures, a 16-month initiative designed to showcase and celebrate the expressions of Muslim artists from around the world. The internationally lauded broadcast series National Theatre Live comes to Easton for the first time in 2017-18, presented in the Landis Cinema at Buck Hall located at North 3rd & Snyder Streets on the newly completed downtown arts campus at Lafayette. Launched in 2009, this groundbreaking project from the National Theatre showcases its own outstanding productions as well as those staged at London’s Barbican, Donmar Warehouse, and other notable UK theatrical venues. National Theatre Live captures performances before a live audience, then presents them in high definition in cinemas throughout the world. 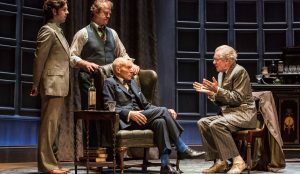 The inaugural season of National Theatre Live Downtown features Ian McKellen and Patrick Stewart in Harold Pinter’s No Man’s Land (Sept. 10); Lucian Msamati in Peter Schaffer’s Amadeus (Oct. 1); Jude Law in the stage adaptation of Luchino Visconti’s 1943 film Obsession (Nov. 12); J.M. Barrie’s Peter Pan (Dec. 3, 3 p.m.); Daniel Radcliffe in Tom Stoppard’s Rosencrantz & Guildenstern Are Dead (Feb. 11); Ruth Wilson in Henrik Ibsen’s Hedda Gabler (March 4); and Tamsin Greig in William Shakespeare’s Twelfth Night (April 8). All shows are at 7 p.m. unless otherwise noted. The series is presented by the Williams Center for the Arts and the Department of Theater. From September 2017 through December 2018, Lafayette will explore the arts of Muslim societies in Tapestries: Voices Within Contemporary Muslim Cultures. Funded in part by the Association of Performing Arts Professionals, the Doris Duke Charitable Foundation, and the Doris Duke Foundation for Islamic Art, this multidisciplinary, multidimensional project celebrates the diversity of Muslim arts, cultures, and identities throughout the world and at home in the United States. Tapestries aims to deepen understanding of Muslim cultures and identities through performances on the Williams Center main stage and in related programs throughout the campus and in the community. Four performances at the Williams Center are featured this season: Senegalese pop musician Cheikh Lô & The Ndiguel Band (Sept. 27); Sachal Jazz Ensemble of Pakistan (Nov. 2); Ping Chong + Company’s Beyond Sacred: Voices of Muslim Identity (Feb. 9); and Niyaz—The Fourth Light Project, featuring Iranian-born vocalist Azam Ali (April 11). Additional events can be found at sites.lafayette.edu/tapestries. The 2017-18 Chamber Music series opens with the American premiere of a new work by Sō Percussion, From Out a Darker Sea. Often motivated by inspiring locales, in 2016 this intrepid foursome immersed themselves in the coalfield region of England’s north coast, an area that has struggled following its mine closure under the Thatcher administration. With music, art, narrative, and film, Sō captures and dignifies a proud heritage in a performance true to what The New Yorker calls the ensemble’s “exhilarating blend of precision and anarchy, rigor and bedlam” (Oct. 13). “Passionate, uninhibited and spellbinding,” raves London’s Independent of Brentano String Quartet, now celebrating its 25th year. The quartet brings its ever-prescient authority to Haydn’s Opus 64 and Brahms’ C minor Quartet, then reflects on a musical legacy by alternating movements of Webern’s bagatelles and Schubert’s minuets (Oct. 25). The young Norwegian trumpet soloist Tine Thing Helseth makes her Williams Center and Orpheus Chamber Orchestra debuts when she lends her flawless tone and refined technique to Albinoni’s Concerto No. 9 and Bach’s Concerto in D major. 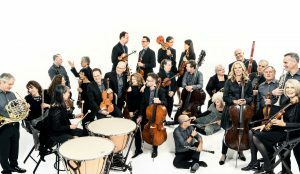 Orpheus’ annual appearance includes entertaining works by Rossini and Haydn, as well as Mozart’s momentous Symphony No. 40 (Feb. 2). Recipient of multiple international music awards, Danish String Quartet has emerged as a “standing room only” ensemble, leaving unforgettable impressions wherever it alights. The quartet’s premiere Williams Center program features works by Bartók and Beethoven, as well as centuries-old Scandinavian folk tunes arranged for string quartet (Feb. 27). A highlight of the performance season will be a special appearance by tenor Mark Padmore with his frequent collaborator, pianist Paul Lewis. With an exceptionally pure and expressive tone, Padmore’s performances of Schubert lieder are in demand on the world’s great concert stages. Named Musical America’s 2016 Vocalist of the Year, Padmore received Gramophone’s 2010 Vocal Award for his critically acclaimed recording with Lewis of Winterreise. At the Williams Center, Padmore and Lewis give their only performance of Winterreise in the 2017-18 season (April 21). A special presentation in both the Chamber Music and Dance series will be New Work for Goldberg Variations, an evening-length ballet and concert created by pianist Simone Dinnerstein and choreographer Pam Tanowitz. Dinnerstein, one of the world’s foremost Bach interpreters and a specialist in Goldberg, brings her dramaturgy and nuanced understanding of the demanding score to bear on Tanowitz’s slyly deconstructed classical movement vocabulary, performed by Pam Tanowitz Dance (Nov. 15). Following on the heels of her 2015 Williams Center debut, Grammy Award-winning vocalist Cécile McLorin Salvant returns to open the 2017-18 season. “Resoundingly eloquent, whether growling the blues or barely breathing, Salvant has inbuilt swing, an actor’s stagecraft, an instrumentalist’s precision of nuance, and an appetite for dusting off rarely performed songs,” clamors the UK’s Guardian of this astonishingly talented artist (Sept. 15). Sachal Jazz Ensemble of Pakistan gained worldwide recognition when its 2011 recording of Western jazz standards went viral, inspiring the feted documentary film Song of Lahore. 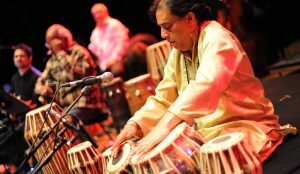 With sitar, flute, sarangi, and tablas, these courageous musicians demonstrate the mutually beneficial influences these two cultures have on one another in a concert that includes American jazz alongside traditional Pakistani music (Nov. 2). A screening of “Song of Lahore” precedes its Williams Center debut on Nov. 1 at Landis Cinema. A legend in the music world, saxophonist Charles Lloyd over nearly five decades has punctuated the post-bop period, embraced the music of a host of world cultures, and enlivened the ’60s with avant-garde improvisation. With The Marvels—Bill Frisell (guitar), Reuben Rogers (bass), Eric Harland (drums), and Greg Leisz (pedal steel) —Lloyd will transport the audience on an unpredictable and enlightening journey (Jan. 27). “The most arrestingly innovative pianist in jazz over the last decade,” according to Vanity Fair, Fred Hersch is an elite member of the piano pantheon, a pervasively influential force who has shaped the music’s course for more than 30 years. He returns with his trio, which The Wall Street Journal calls “one of the major ensembles of our times” (April 18). Opening both the World Stage series and the Tapestries initiative will be a rare U.S. performance—and the only one during the 2017-18 season—by Senegalese singer Cheikh Lô. A laidback crooner with a high, tremulous tone, his voice can suddenly drop to the bassline of Afro-beat, where Cuban influences still hold sway amid the driving beats of mbalax, Senegalese dance music. With The Ndiguel Band, Cheikh Lô sings of peace, love, and spirituality, with a hint of responsible anarchy (Sept. 27). From the small village of El Clavo on Venezuela’s Caribbean coastline comes “the kind of group that world-music fans have always been thrilled to discover: vital, accomplished, local, unplugged, deeply rooted,” states The New York Times. With beautifully tight harmonies, contagious polyrhythms, and nimble footwork, Betsayda Machado y La Parranda El Clavo embodies the epitome of Afro Venezuelan soul (Oct. 18). Included in the World Stage and Tapestries series is Pakistan’s Sachal Jazz Ensemble, performing both traditional music and western jazz standards (see above in “Jazz”) (Nov. 2). 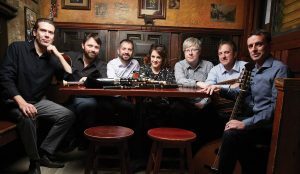 Named for the Mother of the Gods and Ireland’s first tribe, Danú is a uniquely accomplished band of virtuosic players whose slides jigs, reels, and hornpipes are at once entirely fresh and entirely timeless. It returns following its 2015-16 season debut, which introduced the young, award-winning vocalist Nell Ní Chróinín, a specialist of the sean-nós style of traditional Irish singing (Feb. 28). The ensemble Niyaz creates a modern trance tradition with Sufi poetry and folk songs from Iran and surrounding countries, combined with acoustic and electronic music. Led by front woman Azam Ali, whose Iranian heritage and Indian upbringing have formed a singer of richly textured proportions, its immersive new show, The Fourth Light Project, merges virtual and real space to create an illusionistic, three-dimensional environment where music and sacred dance are brought into relief by digital scenography and advanced body-mapping techniques (April11). American theater artist Ping Chong is renowned for addressing important cultural and civic issues of our time. In Beyond Sacred, Chong uncovers the diverse experiences of young Muslim New Yorkers—people who share the common reality of coming of age in a post-9/11 world at a time of increasing Islamophobia. In this interview-based production, the “actors” are real people who reflect a wide range of Muslim identities. With direct, unadorned intent, Beyond Sacred illuminates the daily life of Muslim-American citizens, drawing us closer as a nation with compassion and understanding (Feb. 9). Storytelling is paramount to the idea of Bedlam. Founded in 2012 by Eric Tucker and Andrus Nichols—and critical darlings ever since—New York’s Bedlam theater group cuts to the heart of the drama by collapsing the aesthetic distance in the playing space, paring the cast size (four actors play all roles), and magnifying the primacy of the story. On its Williams Center Performance Series debut, two of Bedlam’s most talked-about productions will be performed in repertory at Lafayette College’s new Weiss Theater at Buck Hall: George Bernard Shaw’s mesmerizing Saint Joan, hailed by Terry Teachout of The Wall Street Journal as “Thrilling! An unforgettable show! The most exciting George Bernard Shaw revival I’ve ever seen, bar none”; and Shakespeare’s Hamlet, fully staged with gripping suspense (Mar. 29-31). The 2017-18 Dance series is marked by three Williams Center debuts from choreographers and companies celebrated for their invention and superb technique. “One of the few bona fide visionaries in the ballet world today” (San Francisco Chronicle), choreographer Alonzo King and his LINES Ballet consistently imbue classical dance with new, expressive potential. Their program features Biophony (2015), a fascinating view of life on earth, set against a soundscape drawn from rainforest, tundra, and meadow. “Gripping, urgently beautiful choreography” (San Francisco Chronicle) and “astonishing originality” (The New York Times) are descriptions that echo the views of King’s countless devotees. Additional works will be announced (Oct. 3). New Work for Goldberg Variations is an evening-length ballet and concert created by pianist Simone Dinnerstein and choreographer Pam Tanowitz. A foremost interpreter of Bach’s iconic score, Dinnerstein will perform live with Pam Tanowitz Dance, uniting her perceptive understanding of the work with Tanowitz’s witty and unflinchingly post-modern abstractions of classical and popular dance (Nov. 15). One of the most gifted auteurs at the nexus of classical and modern dance, Pascal Rioult brings his sensual, articulate, and exquisitely lyrical ideas to bear on WOMEN ON THE EDGE…Unsung Heroines of the Trojan War. In a trilogy inspired by Euripides’ tragic heroines—Iphigenia, Helen of Troy, and Cassandra—RIOULT Dance NY captures the grace, strength, and resilience of women in society, as well as the futility and immorality of war. The program includes Iphigenia, On Distant Shores, and Cassandra’s Curse, set to commissioned music by contemporary American composers Michael Torke, Aaron Kernis, and Richard Danielpour, respectively (Feb. 21). The ideal introduction to the beauty and enjoyment of the performing arts, Williams Center Family Matinees invite young people and their grownups to experience music, dance, and theater together. Family Matinees include Information & Discussion guides distributed in advance and Meet the Artists receptions in the lobby following the shows. For more than 20 years, JazzReach has introduced new audiences to the richness of the authentic American art form. Featuring the critically acclaimed Metta Quintet, ELLINGTON! is an engaging, interactive, multi-media performance that illuminates the vital legacy of the great Duke Ellington, offering a wide array of his musical achievements, from hit songs to blues riffs to extended suites and scores for stage and screen (Nov. 4). 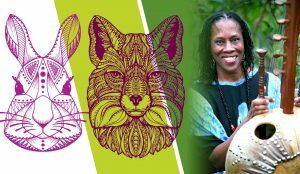 Storyteller Charlotte Blake Alston is known around the world for her interpretations of African and African-American tales. In Stories & Songs in the Oral Tradition, Alston enlivens the exploits of such archetypal characters as Anansi the Spider and Br’er Rabbit with warmth, humor, and a great deal of magic. Alston is an accomplished musician as well, and her performances are enhanced by accompaniment on traditional instruments like the djembe, mbira, shekere, and 21-stringed kora (Mar. 3). The Williams Center for the Arts is supported by the National Endowment for the Arts, Association of Performing Arts Professionals, Doris Duke Charitable Foundation, Doris Duke Foundation for Islamic Art, Pennsylvania Council on the Arts, Mid Atlantic Arts Foundation, Andrew W. Mellon Foundation, New England Foundation for the Arts, Dexter and Dorothy Baker Foundation, and Friends of the Williams Center.